Hawking applied Quantum Mechanics to Black Holes in order to derive his famous formula..
S is Entropy and A is the area of the event horizon. 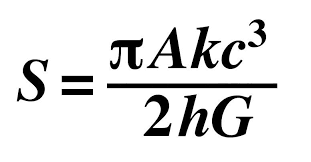 All the other things in the formula are constants of nature. So the formula says the entropy of a Black Hole is directly proportional to the area of its event horizon.